At 6 a.m. the phone rang, awaking James Estes. Estes remained silent in astonishment. On April 29, UC Santa Cruz ecologist James Estes and seismologist Thorne Lay were elected to the National Academy of Sciences (NAS), a prestigious society that provides scientific and technological advice to the U.S. government. Membership in the academy is very selective and a mark of distinction for scholars. The NAS researches and releases reports on technology, medicine and the physical, biological and social sciences. Since non-members and members alike conduct the research, election is a gesture of recognition, said dean of physical and biological sciences Paul Koch. 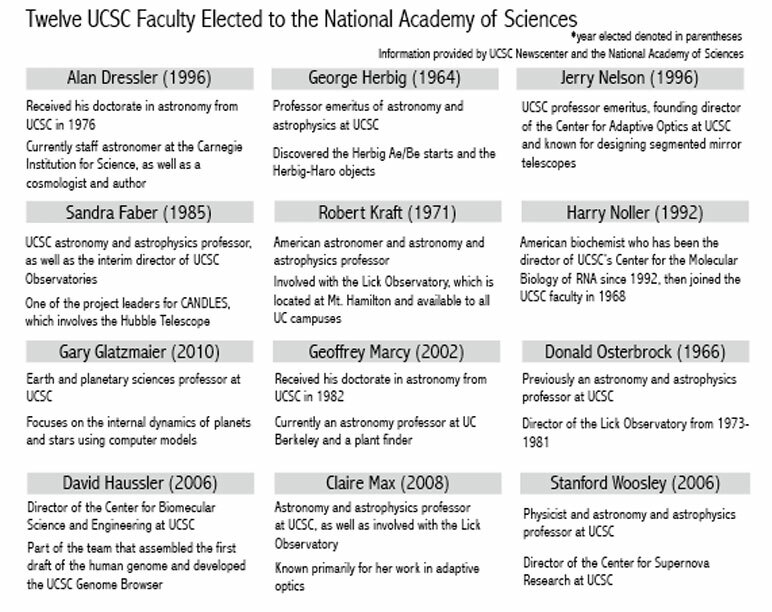 Twelve UCSC faculty are members of the NAS, and the recent elections of Estes and Lay indicate the growing authority of UCSC’s research, Lay said. “Because UCSC is a younger institution, there have not been very many homegrown academicians, [but] we’re seeing the maturation of the campus programs and the recognition that we have very strong programs,” Lay said. Estes and Lay were elected to the NAS for their acclaimed research in marine ecology and seismology. Estes’ research deals with the role of sea otters in maintaining healthy kelp forests. For 30 years, Estes traveled to the Aleutian Islands in Alaska, comparing islands with natural levels of sea otters to islands where populations have been reduced by excessive hunting. His research highlights the benefits sea otters contribute to kelp forests and emphasizes the dynamic role large predators play in maintaining healthy ecosystems. Lay’s election was based on his research studying the seismic waves released through the ground from earthquakes, volcanoes and explosions. “Earthquakes release energy that produce seismic waves. We have sensors, like stethoscopes, listening to the earth that hear when waves are released and spread through the rock,” Lay said. By detecting and analyzing seismic waves, Lay researched earthquake detection, mapped the interior of the earth using sonar-like technology and enforced nuclear test ban treaties. However, both professors emphasized the collaborative effort of their research. Estes expressed similar gratitude for his colleagues and students. A week after the election, Estes and Lay said the afterglow still remained.